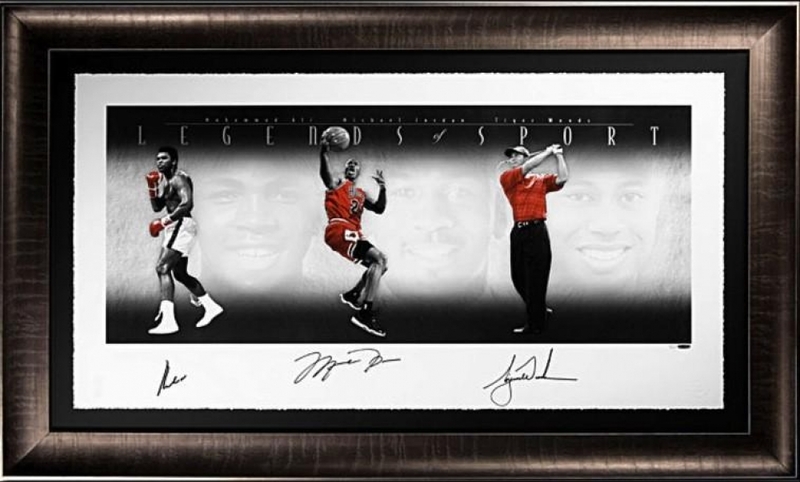 Custom framed photo measures 33" x 58" in size and has been hand-signed in black felt-tip pen by Muhammah Ali (D 2016, HOF), Michael Jordan (Bulls HOF), and Tiger Woods. Platinum edition display, hand numbered #/100. 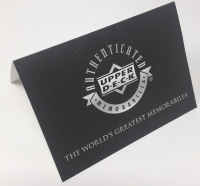 In celebration of three of the greatest athletes of all time, Upper Deck Authenticated proudly presents the Legends of Sport Platinum Edition display piece, representing only the second triple-signed memorabilia production of Muhammad Ali, Michael Jordan and Tiger Woods. This framed, limited-edition, mixed-medium art print was produced by an award-winning atelier on P-Velvet archival paper with hand-torn deckled edges. The print illuminates dramatically over a black background while the piece's UV resistant Plexiglas and museum-quality framing ensures the proper preservation of the print.